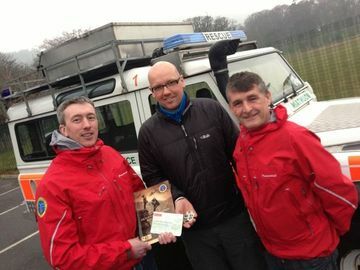 David Miller, secretary of NIYW, had the pleasure of handing over a cheque for £500 to a very appreciative Mourne Mountain Rescue Team and the guys have asked him to pass on their sincere thanks to all in the Northern Ireland Young Walkers for your continued support. As a club we became involved in fundraising for the MMRT last year when one of our members was involved in an incident in the Mournes (not with the club). The MMRT and Irish Coastguard Rescue 116 responded and he was successfully rescued and transported to hospital with a broken ankle and of course a ride in a helicopter. This incident really highlighted what an invaluable job these guys do and so by way of showing our gratitude as a club, we arranged a fundraising walk. The event was a huge success and we handed over a cheque for £1320 towards the MMRT Base Fund. This year at our AGM it was agreed to continue our support by raising the club membership fee to include a £5.00 donation to the MMRT and the cheque handed over will go towards eventually replacing one of their aging Landrovers. The Team rely on people like ourselves as any funding they do receive is continually being cut and so again he would like to pass on the thanks of the Mourne Mountain Rescue Team to the Northern Ireland Young Walkers.